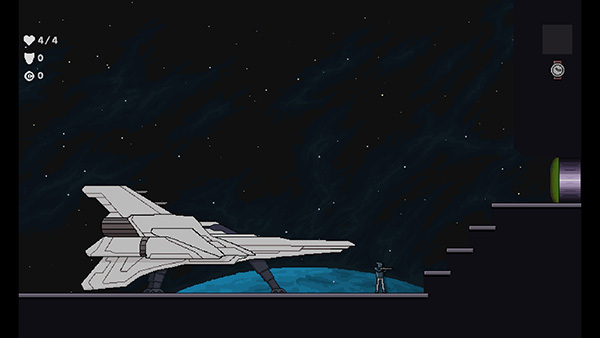 Star Rogue is an upcoming sci-fi roguelike platformer for PC and Linux. 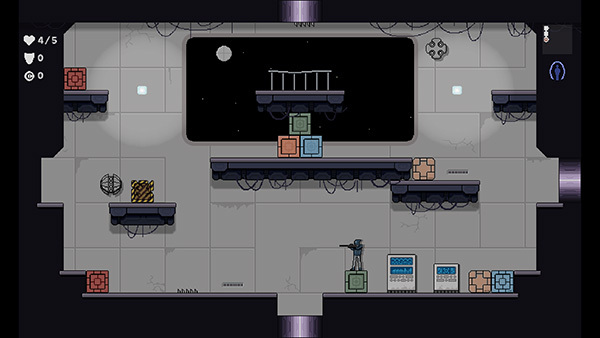 In this challenging pixel indie game you will take control over a brave space marine to investigate an abandoned space station full of traps, robots and aliens. 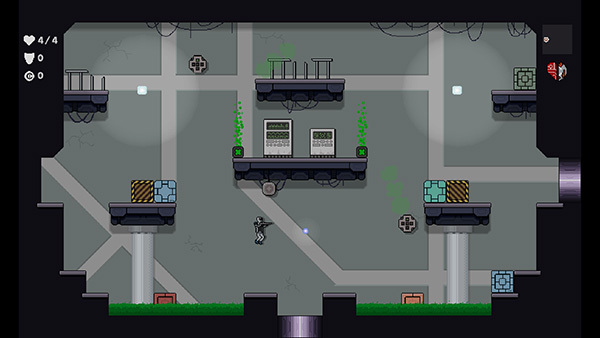 In each playthrough you will encounter a different environment full of randomly arranged rooms. With the choice between several weapons, abilites and different items, your playing experience will be unique each time you play. it's very reminiscent of old flash games I used to play. I think with a bit of polish it can be good. Are you doing all parts of the game, art, sound, etc? The animations leave something to be desired. More wind up, and the enemies moving around are a bit too... static. Moving in precise lines, at a steady speed, without a sense of weight or real movement. When you have an enemy that just kinda floats and bounces along at the same speed you don't really get a sense of their weight. And the enemies themselves are lacking in character. What are the green blobs? Why do green blobs shoot fire? What do they shoot fire from? Why is there a metal ball with a helicopter propeller on it? Why is the blue ball just floating randomly? The metal cross that just bounces around, is it an enemy, item, or just decoration? If there's gravity for the character, why does everything else just bounce around? From the looks of it, you have items down pretty well, and you've made a lot of items for sure. But I think the world itself really needs to be fleshed out. Enemies need to feel meaningful, not just things that bounce around and maybe shoot stuff at you. I'd suggest really digging into the metroid games and study their enemy types, how they move, how they act differently. Also look into Risk of Rain and their enemy types. For the record when it comes to steam I, without hesitation, will skip any game that has "roguelike", "random", and "pixel art" as their selling points (also included in that is permadeath but you don't have that). The market is completely flooded with them, so if you want to make something that gets a chance, you have to really make it stand out both visually, and with a gameplay gimmick. If having a massive amount of items is something you want to make a big point for your game, then you need something to use those items ON. Something to work up towards. Risk of Rain does this extremely well, and you should look into that as well to see what makes this sort of thing work. it's very reminiscent of old flash games I used to play. I think with a bit of polish it can be good. Are you doing all parts of the game, art, sound, etc? The animations leave something to be desired. More wind up, and the enemies moving around are a bit too... static. Moving in precise lines, at a steady speed, without a sense of weight or real movement. When you have an enemy that just kinda floats and bounces along at the same speed you don't really get a sense of their weight. And the enemies themselves are lacking in character. What are the green blobs? Why do green blobs shoot fire? What do they shoot fire from? Why is there a metal ball with a helicopter propeller on it? Why is the blue ball just floating randomly? The metal cross that just bounces around, is it an enemy, item, or just decoration? If there's gravity for the character, why does everything else just bounce around? From the looks of it, you have items down pretty well, and you've made a lot of items for sure. But I think the world itself really needs to be fleshed out. Enemies need to feel meaningful, not just things that bounce around and maybe shoot stuff at you. I'd suggest really digging into the metroid games and study their enemy types, how they move, how they act differently. 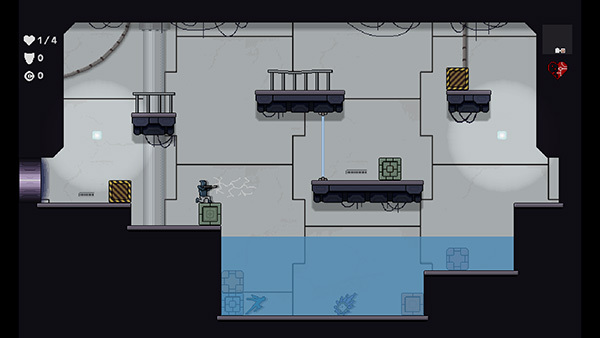 Also look into Risk of Rain and their enemy types. For the record when it comes to steam I, without hesitation, will skip any game that has "roguelike", "random", and "pixel art" as their selling points (also included in that is permadeath but you don't have that). The market is completely flooded with them, so if you want to make something that gets a chance, you have to really make it stand out both visually, and with a gameplay gimmick. If having a massive amount of items is something you want to make a big point for your game, then you need something to use those items ON. Something to work up towards. Risk of Rain does this extremely well, and you should look into that as well to see what makes this sort of thing work. Thanks a lot for your feedback! I agree on the points you made! Enemy AI and graphics/animations are quite sth. the game needs to improve to have a chance! I'll keep working hard on the game and try to improve it as much as possible! 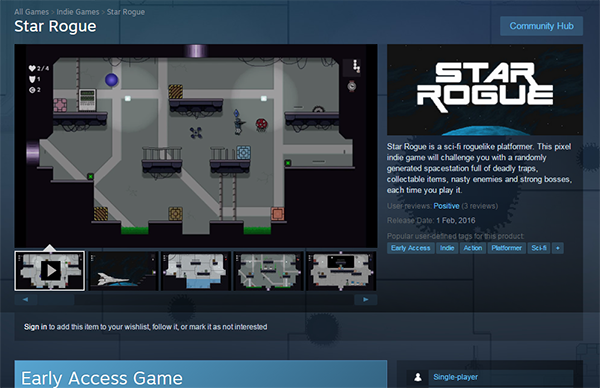 I'm very happy no announce, that Star Rogue is now available on Steam in Early Access. There is a new alpha version v0.35 which improves the overall uniqueness of the different rooms you encounter in this game. It adds several new objects to interact to make each room more diversified. The game is available in Early Access on Steam and there is currently a 40% discount! First of all we have jump pads, which push you up in the air and help you get faster to the higher platforms. Next are moving platforms. 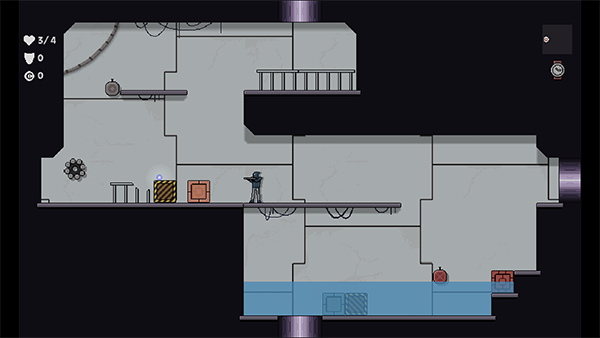 There are two different ones: horizontal and vertical moving platforms. They act like ground, so you can also walljump on them. Also jump through platforms shouldn't be left out in this game. You can jump through them when you are below them and land right on them. Also if you stand on them and press down, you can let yourself fall down. Then we have two new enemies. The first one teleports around and is quite hard to get, the next one spawns a shield around him from time to time, making him immune to laser projectiles. Most of the existing rooms were modified and have now some of the new objects listed above to make them more unique. I also added many new rooms with completely new layouts. I returned to developement and want to share this new version with you. It's an effort to streamline the game and make characters more unique. I quite enjoy roguelikes (had a blast with Risk of Rain), so I might take a look at this. I quite enjoy roguelikes (had a blast with Risk of Rain), so I might take a look at this. Good work! @DJGrenola: Thanks! I hope the game is good enough yet that you enjoy playing it! this patch brings some controller improvements and bugfixes as well as the new 2 player hot seat multiplayer coop game mode. The next patch will concentrate on fixes and improvements! This patch introduces the Linux version of the game. It's now downloadable from the Steam library. Finally the steam achievements are implemented! I plan on adding more in later patches! Rebinding controller and keyboard keys is now easier, more animations and various bugfixes!